Most of this is the result of the changes that have occurred in the past year since I last posted a recipe. I stopped posting because, at first, I was teaching a summer course and simultaneously preparing for a big move to…well at the time we had no idea. We officially moved out of Pittsburgh July 15 of last year. It wasn’t until about a week later that we realized that we would be heading off to Philadelphia for B to start his post doc position at the University of Pennsylvania. Since our move we’ve been very blessed and lucky to have a wonderful new place, be surrounded by our wonderful friends and family, and receive wonderful news from them (babies..they be a comin’). But in the process I have focused on my work, my life, and things outside of being creative with food and food items. But, the time is returning where I need my hobby back. Sure, I’ve made some awesome things in the past year (I’m looking at you boeuf bourguignon) and some terrible things (ask B about the pizza I made a few weeks ago of the hoagie rolls I attempted to make last week from scratch…they were more like matzoh than roll) but just failed to document both my successes and failures. In all aspects of life we see successes and failures and its important to see how these failures are important to make me/you a better cook, person, etc. So, on that note, I’m focusing this post on transformations. Not just my own in the past year since I last posted but also how its important to transform things in our everyday lives. To make the bad good, make lemonade out of lemons, etc. So that is how this recipe started. I sought to transform the bad and make something good. I traveled to San Francisco to go to an annual conference to present some of my current work. Before I left, I prepared a number of “in a bag” meals for B to just throw into our slow cooker since he would be swamped with all that he had to do. One of those meals was this recipe for pot roast. So first, another transformation note: I started eating meat again Memorial Day weekend 2012. This is important because I messed up something I’ve made before: meat. Although I’ve made pot roast before, I used the Pioneer Woman’s recipe (found here). That came out really, really good. This recipe, however, was terrible. B only had a little of it while I was away and found it too tomato paste heavy. Given that we had this big batch of pot roast, complete with meat and potatoes, what’s a girl to do so that I don’t waste food. I decided to make meat and potato burritos. What I first strained the liquid out of the pot roast and veggies. I next took the meat out and shredded it up to kind of get that carnitas aspect for my burritos. I did this using two forks and just pulling the meat apart. 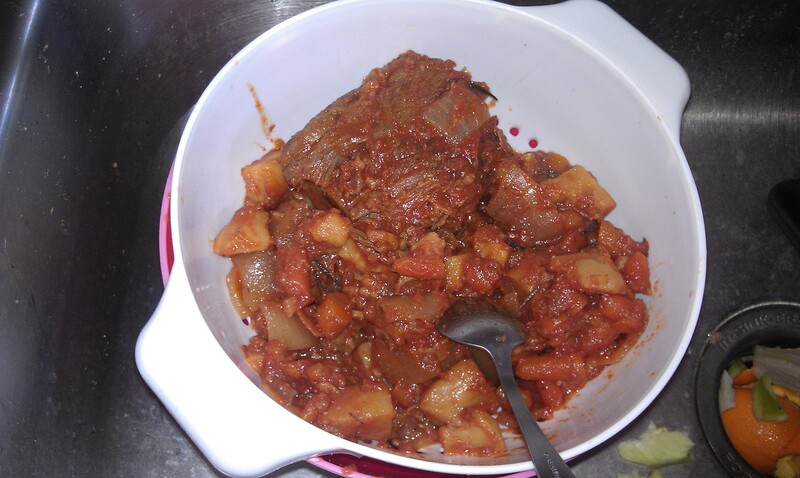 Next, I chopped up some peppers and onions and added those, along with the pot roast vegetables, to a large saute pan. I just let them cook up together. I then moved on to taking the pot roast towards the tex-mex flavor side. This was accomplished by flavoring the vegetable mixture with about 2 tbsp cumin, 1 tsp cayenne pepper, 1 1/2 tsp garlic powder, and about 1 tsp of salt and pepper. This was adjusted according to my taste after adding in the initial amount (I honestly am not sure how much it ended up being since it was mostly to taste. 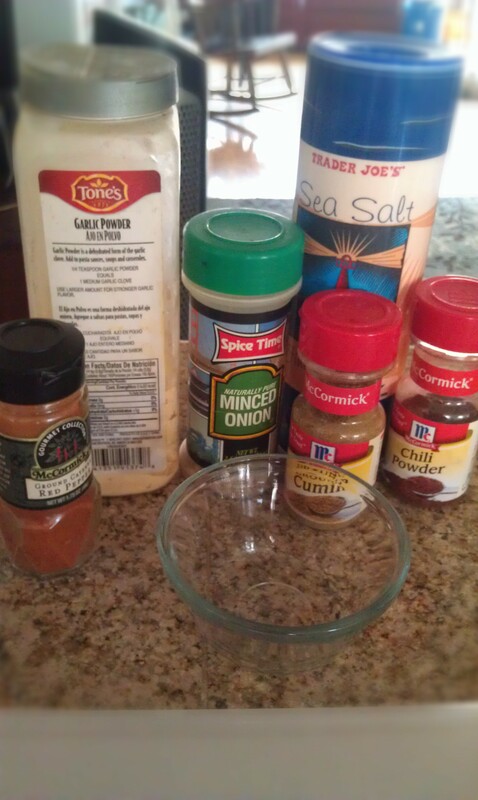 Using many of the same seasonings (shown here are cayenne, garlic powder, minced onion, salt, cumin, and chili powder) I made my own taco seasoning mix (many recipes for this can be found by using google or another search engine). 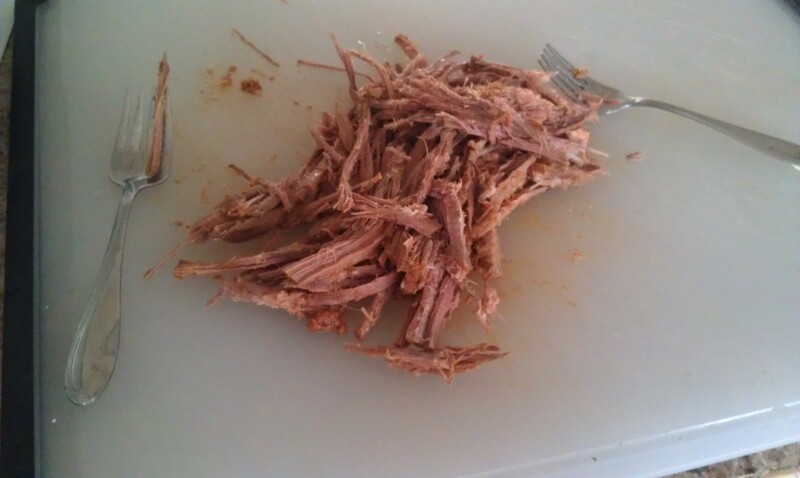 Using the liquid I removed from the pot roast at the start, I added the seasoning to the liquid. 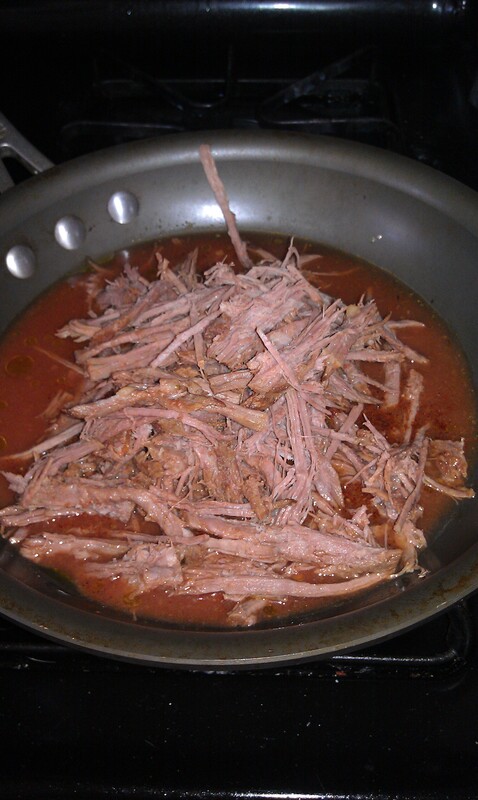 I then added the shredded beef. I let that simmer for approximately 10 minutes, or until the meat was flavorful and well coated. While that was simmering, I preheated my oven to 350 F. Once the meat was done, I took tortillas, filled them with cheese, meat, and the vegetable mixture, then wrapped them into burritos and put them in a baking dish. I repeated until I ran out of tortillas. I then topped the burritos with jarred salsa and cheddar cheese. Viola, transformed pot roast. B went into it with a “I’m skeptical about this” attitude but left being pleasantly surprised. So this begs the question of, what else that starts out bad can be transformed into something good?